In Jack Coleman's Wind farmer's almanac today, he makes a strong link between the leisure class and anti-environmental efforts. Excerpts from economist Thorstein Veblen's incisive analysis, "The Theory of the Leisure Class," as relevant today as when the book was published in 1899. A tip of the hat to author William Tucker, who wrote an essay for Harper's magazine in December 1977 titled, "Environmentalism and the Leisure Class: Protecting birds, fishes, and above all, social privilege." The essay describes efforts to thwart the proposed Storm King energy project on the Hudson River, an eerie precursor to similar efforts decades later against Cape Wind. Tucker punctuated his essay with excerpts from "The Theory of the Leisure Class," several of which are also cited here. "... If any portion or class of society is sheltered from the action of the environment in any essential respect, that portion of the community, or that class, will adapt its views and its scheme of life more tardily to the altered general situation; it will in so far tend to retard the process of social transformation ..."
" ... In the redistribution of the conditions of life that comes of the altered method of dealing with the environment, the outcome is not an equitable change in the facility of life throughout the group. The altered conditions may increase the facility of life for the group as a whole, but the redistribution will usually result in a decrease of facility or fullness of life for some members of the group ..."
" ... An advance in technical methods, in population, or in industrial organization will require at least some of the members of the community to change their habits of life, if they are to enter with facility and effect into the altered industrial methods; and in so doing they will be unable to live up to received notions as to what are the right and beautiful habits of life ..."
" ... Any change in men's views as to what is good and right in human life make its way but tardily at best. Especially is this true of any change in the direction of what is called progress; that is to say, in the direction of divergence from the archaic position ..."
" ... The leisure class is in great measure sheltered from the stress of those economic exigencies which prevail in any modern, highly organized industrial community. The exigencies of the struggle for the means of life are less exacting for this class than any other; and as a consequence of this privileged position we should expect to find it one of the least responsive of the classes of society to the demands which the situation makes for a further growth of institutions and a readjustment to an altered industrial situation ..."
" ... The leisure class is the conservative class. The exigencies of the general economic situation do not freely or directly impinge upon the members of this class. They are not required under penalty of forfeiture to change their habits of life and theoretical views of the external world to suit the demands of an altered industrial technique, since they are not in the full sense an organic part of the industrial community ..."
"... Therefore these exigencies do not readily produce, in the members of this class, that degree of uneasiness with the existing order which alone can lead any body of men to give up views and methods of life that have become habitual to them. The office of the leisure class in social evolution is to retard the movement and to conserve what is obsolescent ..."
" ... Since conservatism is characteristic of the wealthier and therefore more reputable portion of the community, it has acquired a certain honorific or decorative value. It has become prescriptive to such an extent that an adherence to conservative views is comprised as a matter of course in our notions of respectability; and it is imperatively incumbent on all who would lead a blameless life of social repute ..."
" ... Conservatism, being an upper class characteristic, is decorous; and conversely, innovation, being a lower-class phenomenon, is vulgar ..."
" ... The first and most unreflected element in that instinctive revulsion and reprobation with which we turn from all social innovators is this sense of the essential vulgarity of the thing. So that even in cases where one recognizes the substantial merits of the case for which the innovator is spokesman -- as may easily happen if the evils which he seeks to remedy are sufficiently remote in point of time or space or personal contact -- one still cannot but be sensible of the fact that the innovator is a person with whom it is at least distasteful to be associated, and from whose social contact one must shrink. Innovation is bad form ..."
As if to echo Veblen and Coleman's observations, this story in the Palm Beach Evening News shows us how the leisure class is faring today. FOR YEARS NOW a story line in Massachusetts has featured the Kennedy family, enthusiastic environmentalists all, loudly opposing one of the most environmentally progressive schemes in the state's history: a large, offshore wind farm known as Cape Wind, to be placed in Nantucket Sound, the only viable site for such a farm off the New England coast. Although the farm would cleanly and quietly produce three-quarters of the total electrical demand for Cape Cod and nearby islands -- a region that could otherwise soon be facing serious power shortages -- and although it has passed through multiple regulatory hoops, both Robert F. Kennedy Jr. and his uncle, Sen. Edward M. Kennedy (D-Mass. ), have denounced the project, in part on the grounds that it would spoil the views "from 16 historic sites and lighthouses on the cape and nearby islands" and presumably from their own summer house as well... Read the rest of The Washington Post editorial here. FOR YEARS NOW a story line in Massachusetts has featured the Kennedy family, enthusiastic environmentalists all, loudly opposing one of the most environmentally progressive schemes in the state's history: a large, offshore wind farm known as Cape Wind, to be placed in Nantucket Sound, the only viable site for such a farm off the New England coast. Although the farm would cleanly and quietly produce three-quarters of the total electrical demand for Cape Cod and nearby islands -- a region that could otherwise soon be facing serious power shortages -- and although it has passed through multiple regulatory hoops, both Robert F. Kennedy Jr. and his uncle, Sen. Edward M. Kennedy (D-Mass. ), have denounced the project, in part on the grounds that it would spoil the views "from 16 historic sites and lighthouses on the cape and nearby islands" and presumably from their own summer house as well. ...Here's one possible explanation. According to capecodtoday.com, the Alliance to Protect Nantucket Sound, founded by Nantucket Island and Cape Cod homeowners and receiving 80 percent of its funding from just 30 people, has spent more than $1 million on Washington lobbyists, including some with ties to Mr. Young. One of the alliance's founders, William Koch -- owner of a Cape Cod summer home, as well as an oil and gas billionaire who might have other reasons to dislike wind farms -- has separately funneled money through his company's Washington lobbyists to another firm that has ties to Mr. Young... Read the rest of The Washington Post editorial here. We have asked every Cape Codder who is seeking elective office in this November election to let us create a free "Cape Blog" for them. To date four have taken us up on the offer, and they're all Republicans. Is this an example of why the GOP does so well at the polls even when they're in the minority? So I'm calling all candidates again. Check out our Blog Chowder, and join the fun. Remember, "all ink is good ink," as long as they spell your name correctly. Right now most Dem and GOP candidates are totally unknown to voters outside their own inner circle. You don't win elections that way. We assume that one reason some pols have not responded is the normal, human desire to not attempt something new in which they have no experience. We have a cure for that. CapeCodTODAY.com is willing to train each of you, and at no cost whatsoever. We have a simple tutorial which we supply, and someone is always available if you get in a jam. More importantly, we check every new post of every blog to look for errors, which most times we fix ourselves and email you what went wrong. We even supply photos and other art to enhance your writing. In the next weeks we are putting on group training sessions for politicians by party. The Republicans have accepted our offer, and we'll start training any GOP candidate who wishes to join Bob Dwyer and myself in our training room on Route 134 in Dennis. How about some of you Democrats getting after your Committeemen and Committeewomen to let us do the same for you? Any Cape pol who isn't blogging should turn green with envy. These are all well written, interesting messages which will change minds and influence elections. Our web traffic (the number of people who read our website) has tripled in the past twelve months, and we credit most of that increase to local interest in our blogs which now numbers over fifty and run the gamut of local interests from a forty-something Cape Mom writing about her world to a Big Brothers/Big Sisters staffer who is just beginning a two-thousand mile hike along the Appalachian Trail from Georgia to Maine and writing about it whenever he gets a connection. If you're a pol (or anyone else who wants to blog on CCtoday), email me at [email protected] and we'll have you blogging in a "Cape Cod Minute". The public transportation system is known as the "T" and you'd rather drive in bumper to bumper traffic for 4 hours to get to Boston than be caught dead on the "Orange Line"
53 degrees is "on the warm side"
You call chocolate sprinkles "jimmies"
A water fountain is called a bubbler. Say it "bubbla". You know what they sell at a "packie"
You know what a "regular coffee" is! 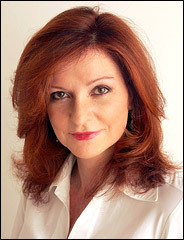 You never say "Cape Cod" you say "The Cape"
New York Times columnist Maureen Dowd (on right) continues to tweak the powerful in a most amusing manner. The Saudi ambassador summoned me to the embassy on Thursday, across the street from the Watergate. He wanted to know if Americans were still addicted to oil. I assured him we were. Prince Turki al-Faisal (in the middle on left), the charming new envoy from the royal family, was confused about W.'s suddenly morphing into Ozone Man, as Poppy Bush called Al Gore in '92. At the State of the Union address at the Capitol Tuesday night, the prince watched with chagrin as the ex-Texas oilman urged breaking our dependence by replacing most Mideast oil imports with wood chips and ethanol, a word usually heard only quadrennially when pols pander during the Iowa caucuses. The prince, dressed in long white robe and checkered headdress, explained that last fall, when Condi Rice was in Jidda, the Saudis and the U.S. launched a "strategic dialogue," which included a promise by the Saudis to pump more oil. And now the president promises that the U.S. will need less oil. Which way are the desert winds blowing? Read the rest of this NY Times Op Ed piece here, and comment below. What do you think, Jim? It COULD happen here ! If you've been reading our Plymouth Pilgrim Blogger, you already know the danger to Cape Cod which is inherent in the Nuclear Power Plant ten miles over the Sagamore Bridge. Watch your worse nightmare unfold. According to an AP story in Monday's Springfield MA News-Leader, "The wind resource in the United States is comparable to the oil resource in Saudi Arabia," said Tom Gray, deputy executive director of the association. "It's a major strategic national resource we should be making every effort to develop." The lead photo (on the right) in the article shows the two turbines from the Jersey-Atlantic Wind Farm which are prominently displayed at the Route 30 entrance to Atlantic City, N.J., on the site of the ACUA Wastewater Treatment Facility. Officials in Atlantic City, N.J., dedicated the nation's first coastal wind farm last month, while Fairfield-based General Electric Co. announced a startup near San Diego of the largest wind power farm on Indian land. Today's Houston Chronicle features a Bloomberg News Service story entitled "Whole Foods makes record purchase of renewable energy". The story goes on to state "The purchase is equivalent to all the electricity used in the company's supermarkets and other buildings, Austin, Texas- based Whole Foods said today in a statement. The credits were acquired from Boulder, Colorado-based wind power broker Renewable Choice Energy. "Offsetting 100 percent of our electricity use with renewable, clean energy strengthens our commitment to be a leader in environmental stewardship by helping to clean the air and reducing our dependence on fossil fuels," Michael Besancon, a Whole Foods regional president, said in the statement. Conventional electricity generation, from such fuels as coal and natural gas, is the largest industrial source of U.S. air pollution, said Kurt Johnson, Green Power Partnership director at the Environmental Protection Agency. The commitment by Whole Foods to wind power is "an outstanding example of environmental leadership," he said in the statement. Why aren't Cape Codders thinking about the vision instead of the view? Palms Springs is one of America's wealthiest cities and one of California top tourism areas. The opening animated gif of Palm's Springs official tourism bureau's web site (above on right) on the area's attractions features their wind farm on the mountains just outside the city as you approach it from L.A. The wind farm is one of America's first and largest and continues to attract visitors more than a quarter century after its opening. Why isn't anyone upset at Nantucket Electric's new cable? A few days ago in the Boston Globe and in today's Cape Cod Times there are articles and photos showing Nantucket Electric building a new electric transmission line across Nantucket Sound in order to meet the Nantucket's surging electric demand. To see the map larger, click here and here to see other maps for the project. In the last decade 4,000 new homes almost all with air conditioning and loads of other electricity consuming devices have been built on the island. Since this cable is double the length of Cape Wind's planned cable and is going through the very same waters in Nantucket Sound, have you ever wondered why the Alliance to Protect Nantucket Sound and WindStop are not throwing themselves in front of the construction vessel? Have you ever wondered why the Alliance spent hundreds of thousands of dollars on lawyers and so called experts fighting Cape Wind's 13 mile cable at the Mass Energy Facility Siting Board and is still appealing the Board's very favorable decision while not attending or uttering a peep during Nantucket Electric's breeze through hearings. Epsilon Associates of Mayard MA built the 26-mile submarine cable from Harwich to Nantucket. The project evaluation and permitting were completed in 16 months. Permitting requirements included Massachusetts Environmental Policy Act (MEPA) review, a Chapter 91 license, wetlands permitting, community meetings, and Cape Cod Commission review. Evaluation of additional supply was considered but not required. A follow-up study was conducted to address environmental and permitting issues with respect to increasing electrical supply to the island with either a second cable or on-Island generation.